This is my Deep South take on classic German Potato Salad, made with a warm bacon dressing, including our Holy Trinity of Southern cooking, along with pickles and juice, sugar, mustard, horseradish, hot sauce and black pepper. Best served warm or at room temperature. We love our Classic Southern Style Potato Salad here in The South, but German Potato Salad is a popular Southern favorite too. I make no claims to the authenticity of this version, but with the inclusion of our Deep South Holy Trinity of Southern cooking, mine is a Deep South take on this classic favorite. 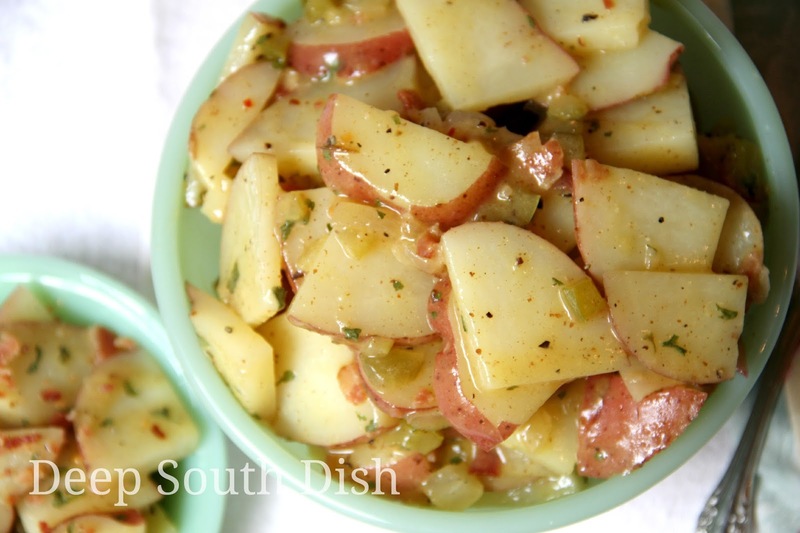 Not only is it the perfect potato salad for our sweet and sour Southern palates, it's a great potluck, picnic and church supper dish too. Here's how I make mine. If potatoes are large, quarter, then cut into 1/4-inch slices. Bring potatoes, water, vinegar and salt to a boil, reduce to a simmer and cook just until tender but still holding their shape, about 10 to 15 minutes; drain and return potatoes to the pot. Meanwhile, fry the bacon until crisp; remove and set aside. Once cooled, chop. Add the onion, bell pepper and celery to the bacon drippings in the skillet and cook until veggies are softened but not browned. Sprinkle with flour and cook another 2 minutes, stirring constantly. Whisk in the pickle juice. Add the sugar, mustard, horseradish, Tiger sauce and black pepper. Cook until mixture begins to thicken. Pour dressing over the cooked potatoes, gently toss to coat the potatoes. Allow to rest for 10 minutes. Add the pickles, parsley and chopped bacon, gently combine, taste and adjust for salt and pepper as needed. Serve warm or at room temperature. If making ahead, refrigerate until needed, bringing to room temperature before serving. For more of my favorite potato salad recipes, visit my Pinterest page! Meanwhile, for the dressing, fry the bacon until crisp; remove and set aside. Once cooled, chop. Add the onion, bell pepper and celery to the bacon drippings in the skillet and cook until veggies are softened but not browned. Sprinkle with flour and cook another 2 minutes, stirring constantly. Whisk in the pickle juice, sugar, mustard, horseradish, hot sauce and black pepper and cook until mixture begins to thicken. Pour dressing over the cooked potatoes, gently toss to coat the potatoes and allow to rest for 10 minutes. Add the pickles, parsley and chopped bacon, gently combine, taste and adjust for salt and pepper as needed. Serve warm or at room temperature. If making ahead, refrigerate until needed, bringing to room temperature before serving. Cook's Notes: I use bread and butter pickle juice. 16 HUNGRY PEOPLE COMMENTED. ADD YOURS! Oh my gosh! I was born in Germany and my 100% German mother made German potato salad a LOT. Sorry Mom, but I think I like this one better! It's your basic GPS recipe but with some modern twists to it and I can't wait to make this! Thanks so much! Probably not as good as Mom's, but if you get around to trying it, please let me know what you think! Oh man, does that look GOOD! It's a shame that my husband doesn't like sweet pickles--so I may just have to make this and eat it all myself. Can't wait to try it! Thanks, Mary! You're welcome! Don't I know that challenge. Mine could live on meat & potatoes, and while I love all kinds of potato salad, he doesn't care for it much at all! Doesn't stop me though - I still make it for myself! This looks great, Mary. I haven't had German Potato Salad in years. My husband is the same way about food, he could live on meat & potatoes, too but I have "introduced" him to other foods over our long marriage. I think I'll try this recipe soon. Will let you know how it turns out. Can you tell me who makes pickle cubes? I've never seen them out here in southern California. Could you use pickle relish? Yes, pickle relish is fine. The cubes are just a slightly larger dice and have more texture than the relish. I usually buy Mt. Olive brand. - peel and slice the hot potatoes, mix with the dressing and pickles and let cool to room temperature. Creamy, sweet-sour-tangy-sharp potato salad. Bacon can be added, but it's not typical here. Thanks so much for sharing though I don't see that my version is much more of an effort than that really. :) Course, frying up some bacon and cooking the trinity of onion, bell pepper and celery is second nature in this part of the U.S. and takes no time really. Heck they even sell the veggie mixture all chopped up for you here! We have LOTS of celery here in the Deep South! :) It's a pretty standard fridge staple, especially down here in South Mississippi & Louisiana. As far as being vastly different in flavor from authentic German Potato Salad, I'm sure it is! I don't claim this recipe to be anywhere near authentic, and never would. It's really just a Deep South U.S. take on our American versions of German style potato salad & I really don't think mine is vastly different in flavor from the versions we enjoy here in the United States, well, not based on the ones that I've had the pleasure to enjoy at least! I finally find time to send you the recipes of the authentic schwaebish potato salad and from the Mecklenburgsischer hering salad with my french homemade mayonnaise. I did see that Cecile - thank you!